$500 WORTH OF GOVERNMENT CHART AND COAST PILOT COVERAGE--MARKED WITH WAYPOINTS, BRIDGES, AND THE ROUTE! 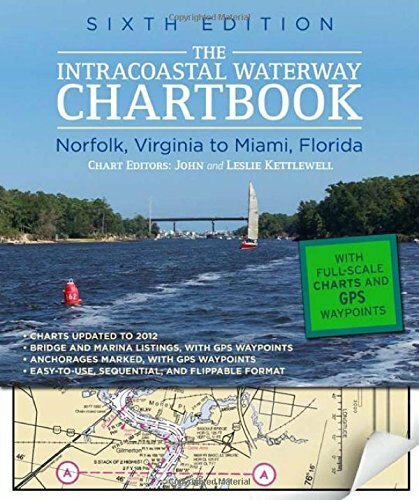 The Intracoastal Waterway Chartbook is a complete set of navigation charts for the 1,090-mile Intracoastal Waterway from Norfolk to Miami, as well as charts for all major Atlantic inlets. The chartbook also includes a complete listing of waterway bridge and lock characteristics; anchorage listings; mileage charts; charts for a picturesque alternate route; and—new to this edition—marina listings—all in a compact, easy-to-use format. The preferred route is marked in magenta on the charts to guide you all the way down (or up) the entire length of the Intracoastal Waterway. Safe anchorage locations are also shown to keep you and your vessel safe--and rested--as you cruise. Waypoints are also given for critical locations along the entire route, allowing you to pre-plot your course in your GPS. Use this all-in-one chartbook alone or as a backup to your electronic navigation. Statute miles are noted in five-mile increments in the chart margins, along with bridge, lock, marina, and anchorage locations. A handy place-name index makes it even easier to go right to the chart showing your destination. JOHN AND LESLIE KETTLEWELL have been exploring the Intracoastal Waterway for more than 25 years. 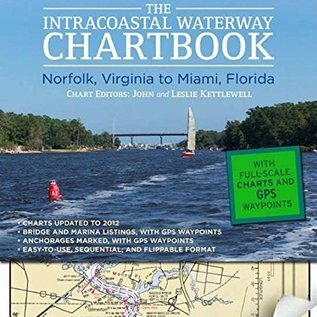 In addition to this chartbook, John is coeditor with Bill Moeller of The Intracoastal Waterway: Norfolk to Miami, the Complete Cockpit Cruising Guide. John and Leslie are members of the Taunton Yacht Club and the Cuttyhunk Yacht Club.